Gil Kerlikowske, director of the Office of National Drug Control discussed drug-policy reform and the Obama administration’s position on national drug use at a National Press Club Luncheon on April 17, 2013. 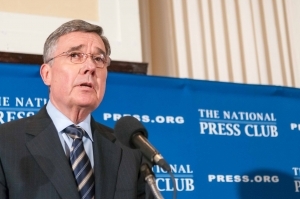 Gil Kerlikowske, director of the Office of National Drug Control Policy, emphasized the Obama administration’s opposition to marijuana legalization during an address at a National Press Club Luncheon on April 17. Kerlkowske’s comments come amid an ongoing push at the state level to decriminalize marijuana most recently exemplified by the passage of 2012 ballot initiatives in Colorado and Washington to permit its private use by adults over 21. The director explained that state laws don’t just create headaches for local law enforcement, education officials and health professionals, but also stand in stark contrast to federal policy. “Our federal United States Department of Justice has the responsibility to enforce the Controlled Substances Act and that remains unchanged,” Kerlkowske said. “No state, no executive can nullify a statute that’s been passed by Congress. When asked by National Press Club Vice President Myron Belkind if President Barack Obama refrained from taking a strong stand against the two states’ ballot initiatives during the 2012 election to prevent alienating voters open to legalization, Kerlkowske replied that the ballot initiatives were likely eclipsed by larger issues but that the president has consistently made his position known.